Robin Hood is a legendary archer and outlaw who, according to tradition, lived in Sherwood Forest and wore clothing of Lincoln Green. Stories about him typically take place in 12th century England, during the reign of Richard the Lionheart. Robin is often depicted as “robbing from the rich and giving to the poor” with the help of his able band of merry men. Robin’s adventures have appeared in tales and songs as far back as the 15th century, with the first prose account of his life being the anonymously authored in The Noble Birth and Gallant Achievements of that Remarkable Out-Law, Robin Hood published in 1678. There are a few poems and fragments from earlier times, when Robin was a recurring figure in drama. So Robin Hood on the screen is just a 20th century adaptation of a very old tradition. Robin’s first appearance in a movie is a 1908 British production, Robin Hood and his Merry Men, directed by Percy Stow. A 1938 American production, The Adventures of Robin Hood, starring Errol Flynn and Olivia de Havilland, is often considered the best Robin Hood movie. There have been at least sixty films featuring Robin Hood and many television series as well. The latest film is a 2018 production Robin Hood, directed by Otto Bathurst, starring Jamie Foxx as Little John and Taron Egerton as Robin. This latest iteration of the tale of the noble outlaw is a stylish steampunk and medieval mashup of weaponry that includes longbows, an armored vehicle, and Molotov cocktails as well as costuming that favors a modern and athletic sensibility. Robin Hood by Howard Pyle, Paul Creswick, N.C. Wyeth. Calla Edition, 2018. This Calla edition is a republication of the work written by Paul Creswick, with color illustrations by N.C. Wyeth, which was originally published by David McKay, Publisher, in 1917. 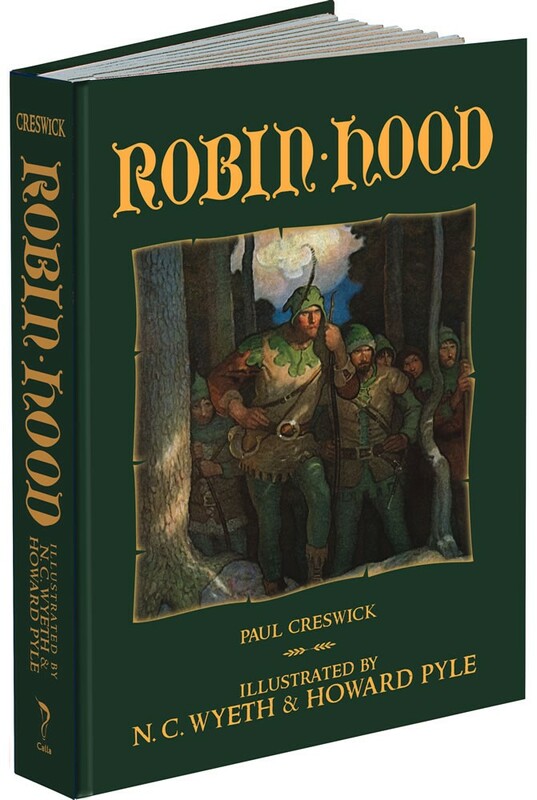 This volume also includes several full-page black and white illustrations by Howard Pyle, taken from The Merry Adventures of Robin Hood, first published by Charles Scribner’s Sons in 1883. Howard Pyle was N.C. Wyeth’s teacher and this combined presentation of their artwork makes a fitting rendition of the exploits of the legendary English outlaw. 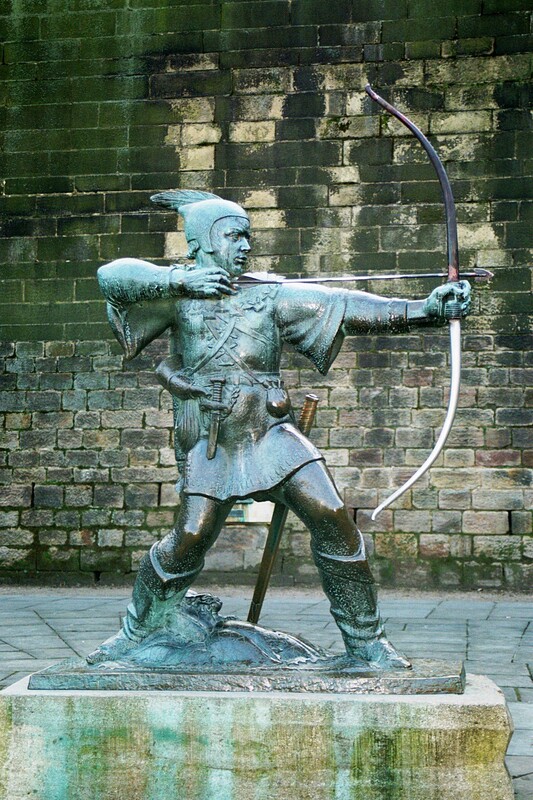 Robin Hood by Bob Blaisdell. Generations of young readers have thrilled to tales about the noble outlaw in Sherwood Forest and his loyal band of Merry Men. Now, their adventures come to life again in this imaginative retelling of this age-old tale. Youngsters will delight in the exploits and feats of valor of Robin, Little John, Friar Tuck, Allan a Dale, Maid Marian, and other members of the band as they fight for freedom and justice against the evil Sheriff of Nottingham. Six new illustrations enhance this edition. 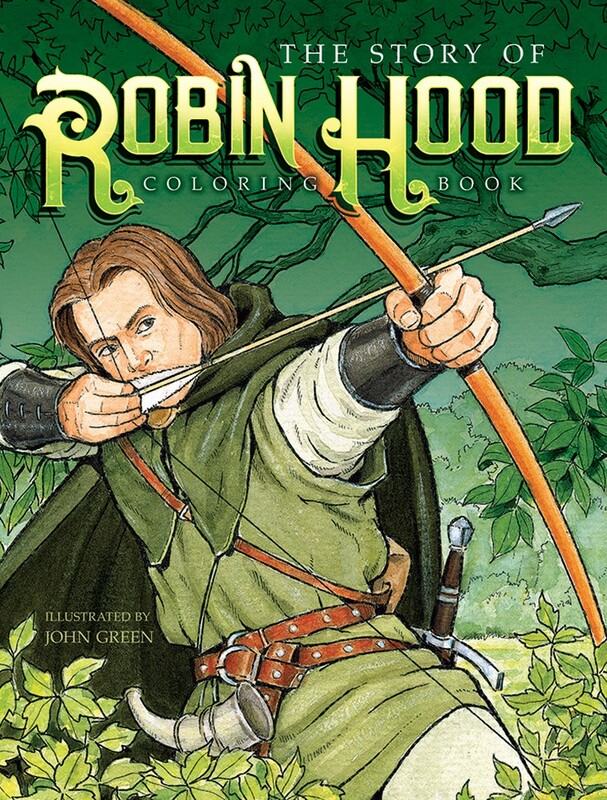 The Story of Robin Hood Coloring Book by John Green. Travel to Sherwood Forest to Join the famous archer and his band of merry men. 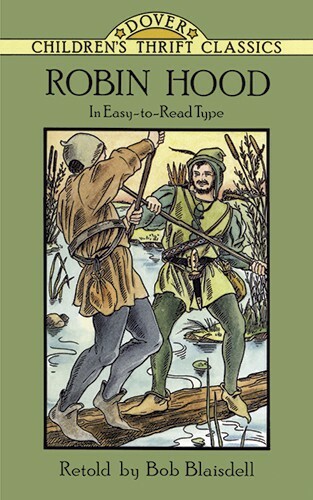 Fort-four illustrations to color, accompanied by informative captions, depict dramatic scenes from the story of Robin Hood and his comrades — including Little John, Friar Tuck, and Will Scarlet — as well as other legendary characters, from faithful Maid Marian to wicked Prince John and the dastardly Sheriff of Nottingham. And if you’re a do-it-yourself kind of guy or gal, don’t overlook the fun and easy yarn dolls of Pat Olski! Robin and Maid Marion are featured on the cover of one of Pat’s exclusive Dover books. 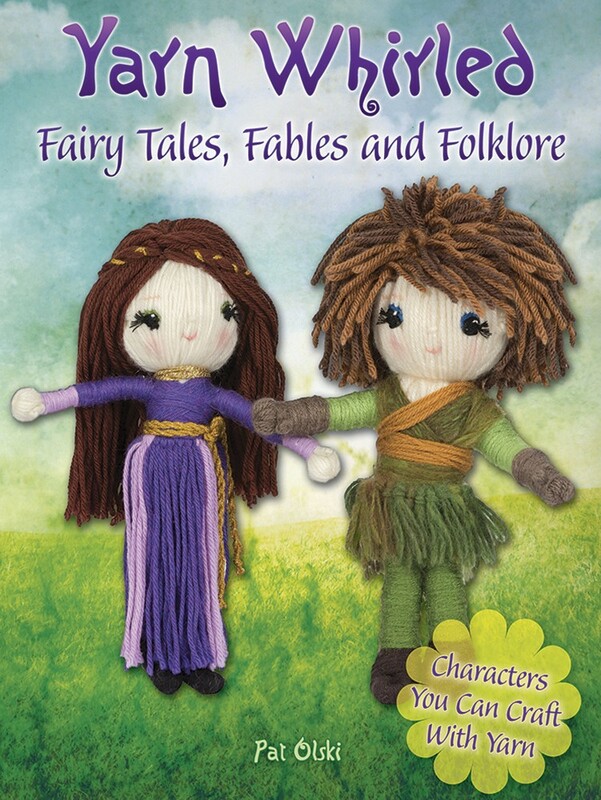 So get the gorgeous Calla edition, see the movie, and make some cute yarn dolls for all things Robin Hood because Robin Hood, that good and noble outlaw, will live forever.